On Saturday 10 November 2012, Afterall organised a symposium titled ‘Artist as Curator’ at Central Saint Martins College of Art and Design, London. After commenting upon the wide areas of practice encompassed by the topic, Elena Filipovic’s keynote lecture discussed how what we call an ‘exhibition’ has been transformed by artists from Marcel Duchamp and Yves Klein to Martha Rosler and David Hammons, and asked what models might be pertinent to write the history of these changes considering how much they trouble traditional understandings of authorship. This was followed by the first session, titled ‘Spaces’. Elena Crippa spoke about Richard Hamilton and Victor Pasmore’s involvement with exhibition-making; their interest in exhibition display, design and architecture; and their conception of space as a site for interaction, which led to their well known installation an Exhibit (1957). Ekaterina Degot then looked at some of the apartment galleries created in Moscow in the 1980s and early 90s, such as Apt Art and Trekhprudny Squat, and suggested that if it was politically risky for an artist under capitalism to quit the safe territory of autonomous art for a communal life, it was just as dangerous for an artist under an anti-capitalist system to quit communal life for art-making. In the second session, ‘Communities’, Alison Green examined the way that Group Material’s curatorial practice converged with activist politics, re-thinking the exhibition form whilst addressing politically urgent issues and initiating audience-participation. Green focused upon the first year of their activity, when the group rented a storefront gallery on Manhattan’s Lower East Side. Her presentation was followed by David Teh who considered the professionalisation of artist-curator in Southeast Asia and offered a certain scepticism towards the repeated appearance of certain artists and tropes when international curators represent art from this region. The third and final session was titled ‘Practice’ though the question of practice was at the heart of the whole symposium. Valerie Smith provided an in-depth reflection upon Mike Kelley ‘exhibition within an exhibition’ , ‘The Uncanny’ (1993) which she originally invited him to do as part of Sonsbeek ’93. This was followed by Willem de Rooij, who presented his exhibition ‘Intolerance’ (2010), a show that brought together bird portraits made by Melchior d’Hondecoeter in the seventeenth century and feathered ceremonial objects made in the eighteenth century in Hawaii, and then discussed the exhibition with Pablo Lafuente. 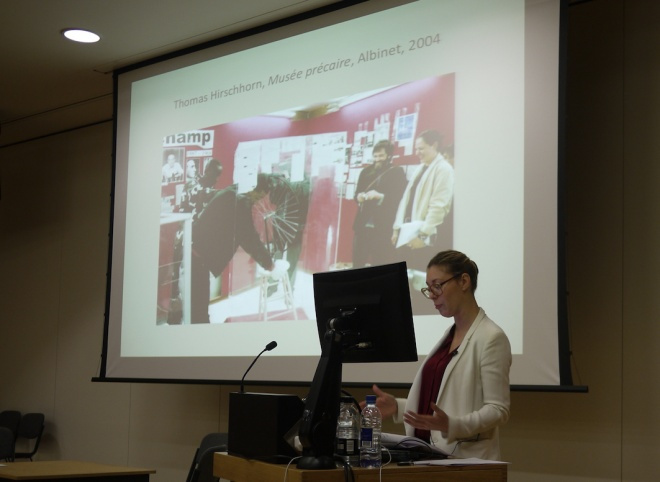 The day finished with Ruth Noack who flipped the terms of the discussion with her paper, ‘Curator as Artist?’, and reflected upon curatorial thinking as part of an artistic practice, questioning where the boundaries between making art and making exhibitions can be drawn. Visit our videos page or click on the speakers name to watch video documentation of their talk. Join our newsletter to be kept updated about upcoming Afterall events and publications, and for new online content. This event was organised by Afterall, MRes Art: Exhibition Studies programme, ‘Exhibitions: histories, practices’ research group and RAW at Central Saint Martins, with the support of the Henry Moore Foundation, Mondriaan Fonds and the Research department of Central Saint Martins College of Art and Design. The research forms part of the Exhibition Histories project, developed by Afterall in association with the Academy of Fine Arts Vienna; the Center for Curatorial Studies, Bard College; and Van Abbemuseum.